I have made countless resolutions and goals throughout my life. Through them all, I have come to one conclusion: goals are much better than resolutions. Resolutions are often generalizations what I can’t, shouldn’t, or won’t do. Goals are about moving forward and growing, with a deadline in mind. There are several individuals who have influenced my goal setting for 2012. I love the focus of My One Word. The idea is to simplify your goals to one concept, one word. While I haven’t considered this for a couple of years, I felt one word impressing upon my heart these last few months: finish. So how do I set those goals? I’ll be writing more about that on the 30th, but this year I’m using Michael Hyatt’s free ebook, Creating Your Personal Life Plan to help me make sure those goals are in alignment with my values. I have a few items that will definitely be on my Finish Year list. Come back Friday to read about the simple process I go through to set my goals. Are you setting goals for the new year? What’s on your list? I love the book of James…I think it’s great that you’ll be committing it to memory. I blogged about my “goals” today….do random acts of kindness with my kids, plant a container garden, pray for my hubby more, find a haircut I like…and the list goes on!!! I will be leading a class studying the book of James and we have the option to memorize it, I’m looking forward to the challenge and opportunity. I have never tried to memorize that much…ever…much less in a few months’ time. We did container gardening at our last home and had success with tomatoes, bell peppers, and jalepenos. Best wishes for success! 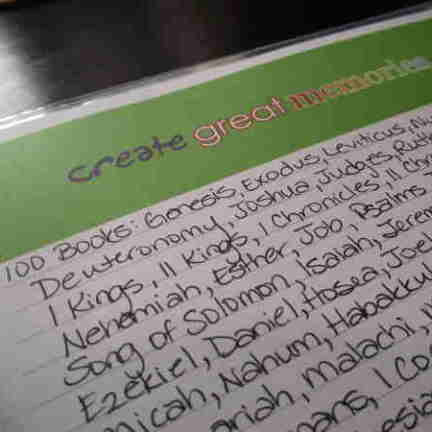 wow, memorize the book of James – quite a goal there my friend. I probably need to make “blogging” for personal life a goal of mine since I have neglected to do that so much! We all have seasons don’t we Alyssa? Sometimes more work, less play. Then later we can have a season of less work, more play. Best wishes in balancing it this year! Such an awesome word! We’re studying James as well in a series my husband is preaching. LOVE that book. A couple years ago, I started memorizing Colossians, but didn’t “finish”. Maybe I should adopt that word this year too!! Rachel, I am only a few days into this study but it’s already opened up the opportunity to teach my teens more about the history of the early church. Those are the moments I love what I’m studying more than words can express. Praying God blesses your efforts to finish this year…and that you ‘know’ him more.